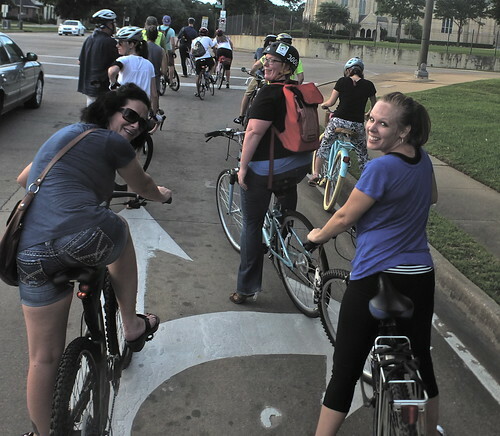 The Bikeshreveport.com July Critical Mass ride - last Fri of each month - begins about 7 pm, although the starting time says 6:30 pm. "This month's ride will take us through Broadmoor and end at the family-friendly Marilynn's Place, " says Arms Brown. The start point is Columbia Park at Creswell Ave. This month if you show up at 6PM you can learn from some masterful and caring riders about how to be better at biking. Stephen Pederson will demonstrate braking effectively and safely. Long-distance rider John Fontaine will instruct on negotiating bumps and obstacles. Bike tech Daniel Martin will show riders how to be smart when starting and stopping. 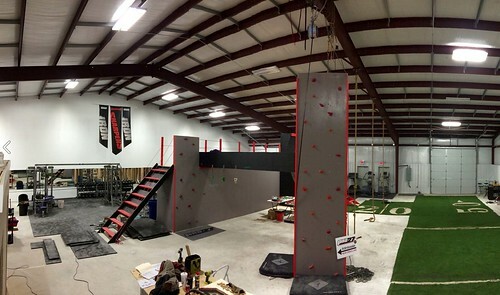 The “Climb for the Museum and Norla” night hosted by Norla Preservation Project, FUNdamentals Society of Marlene Yu Museum and Rainforest Art Foundation, and Climbossier at Pro27 Athletics will take place Mon, Aug. 3, from 5:30-7:30 pm. Climbossier is located at 3700 Old Shed Rd., Bossier City, LA 71111, says Iris MacLean. The Shreveport-Bossier community is invited to help the Yu Museum and Norla with this free but suggested $10 donation community event. All attendees will have a chance to win swag bags filled with local goodies when they sign up for the email list. Prepared Nutrition and Fleur de Crème will provide complimentary infused water, healthy snacks, and ice cream samples. Multiple activities will be available for different ages and skill levels, including novice and experienced climb routes, and bouldering for small children. 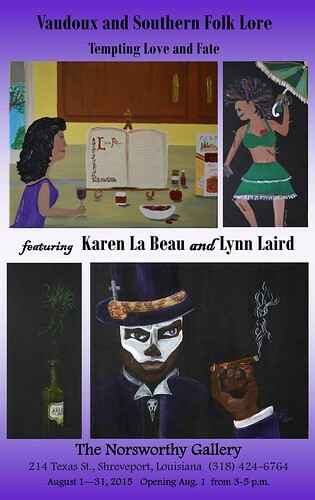 Self-taught painters Karen T. La Beau and Lynn Laird, both well-recognized in Northwest Louisiana, exhibit paintings side by side at Norsworthy Gallery in August. La Beau lives in Highland, Shreveport, but was born and raised in New Orleans. Her acrylic paintings have won steady recognition. This year her art will appear in exhibits in New Orleans and Lafayette as well as Shreveport - at Norsworthy Gallery, Texas St. Her studio is on the Highland Open Studio Tours on first Sundays, 11 am to 4 pm. Lynn Laird claims the rich culture from the Mississippi delta to the Louisiana bayous in describing influences in her art. "Tending towards realism, often with a surreal twist, her artwork has been noted for its sense of detail earning her several awards. Bringing that skill into the traditional art of scrimshaw, an eye for fine detail and talent for delicate line work has garnered her much success among national and international collectors," says the Laird web site. 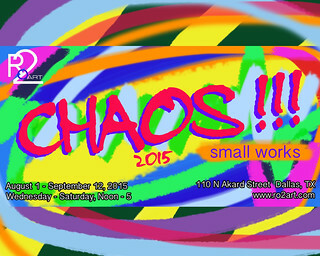 The opening is Sat, Aug 1, 2015, from 3-5 pm. See the paintings from Aug 1 - Aug 29. 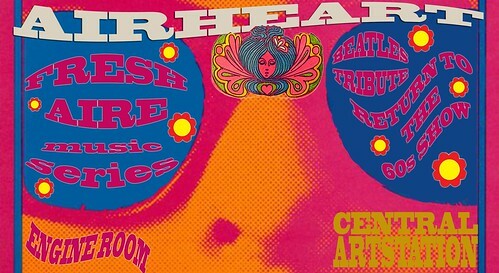 Acoustic trio Airheart will perform an all-Beatles music tribute at Central Artstation on Tues at 6 pm, says Dan Garner. Costuming evocative of that golden era will be welcome and honored. The Fresh Aire series features local music on the last Tuesday of each month, presented in a smoke-free, café-style atmosphere, where children are welcome. Cash bar. A food truck. Free “healthy” chocolate chip cookies for early arrivals. $10 at the door. 5 and under admitted free. Doors open at 5:30 p.m.
Graphics by Dan Garner, one of Shreveport's media masters. Nick Cave, visual and performance artist, is the topic at the Shreveport Regional Arts Council's Roster Artists meeting at Central Artstation. The meet will be at 5:30 pm on Mon, July 27. 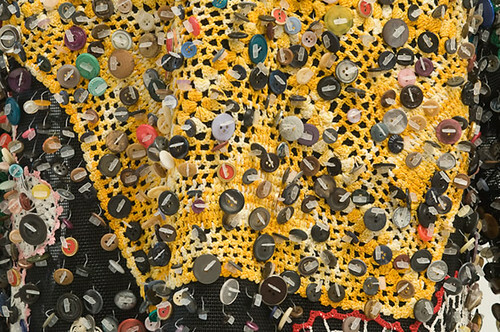 Residency artists chosen by Nick Cave are Jerry Davenport, Karen Lebeau, Robert Trudeau and Kathryn Usher. Linnea Fayard Allen looked like she'd dropped in from Las Vegas to do the musical Chicago on Thurs night at Shreveport Little Theater. Her dancing, singing, smile, eyes, figure and vibe were top tier. Happily, Jennifer Warren, her foil, proved a gifted, appealing and watchable dancer, comic and hip-shaking broad. The balance between the leggy beauties was satisfying. Enter John Bogan as the rapid firing, freewheeling attorney. 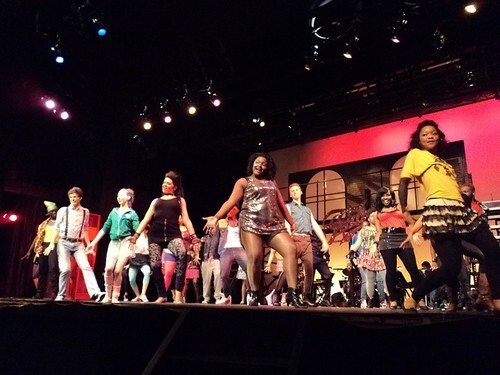 Sizzling community theater was the result. The trio were ably supported by a seasoned and tuneful gang of criminals, including the put-upon Michael Powell and the embodiment of a bluesy mama, Barbara Holmes. The Chicago jazz orchestra, under the direction of Adam Philley, was on time and well modulated in volume (as heard from row H). There was piano (Robert Young), percussion (Kyle Denton), banjo (Bill Allen) and a honking horn section, which included Terry Wright, Paul Tinker, Hannah Morris, Bob and Candy Maynard and Cory Knippers. Then there were the slinkies, the leggy gals and guys who added the hot mess factor. Well-choreographed and seemingly always in the right place with the right amount of shoulders and legs in the light were Brett Kessel, Leslie Townsend, Tori Smith, E. Grace Rambo, Gabrielle McFerren, Allison-Rebekah Miller, Hannah Morris, Taylor Green, Annie Barker, Claire Marie Watson, Nancy Dennis Campbell, Lisaann Kemper, Karisca Sellers, Kelly Vaden, Shalem Johnson and Tessa Anderson. Also Tristian Moss, J. Allen, Serdalyer Darden, Jamie Johnstone, Leo Vanderkuy, Christopher White, Luke Digilormo, Cody Allums and Victor Robert. Laura Beeman Nugent's direction was tight. No apparent cues were missed on Thurs night, when the show ran 2 hours and 20 minutes. There were no issues with mics. Articulation by the principals was exemplary. And the chorus sang with tuneful majesty. David White's lighting design was atmospheric, as was the set by Chris Gonzales. Costume designer Peggy San Pedro impressed by variety within consistency. See performance dates and order tickets, $25. Box office: 318-424-4439. Wicked Wonderland, The Annual Auction Against AIDS, is the major fundraiser for the Philadelphia Center, says Garrett Johnson. Wicked will be presented on Sat, Aug 29, 2015, 6pm - 10pm, at the Shreveport Convention Center in the Captain Shreve Ballroom. Tickets are $50 and are available at the door. This week, though, tickets are on sale for 25. That holds through July 31. "The best way to show your support of The Philadelphia Center and the Auction is to become a sponsor, starting at $150," adds Johnson. "The Annual Auction Against AIDS began as an art auction," observes Johnson, "but has grown to include an array of products, services, and gift cards from local and national businesses and from individuals alike." Donations: gjohnson@philadelphiacenter.org or 318-222-6633 ext. 2016 in order to schedule an item pick up. The adjacent Hilton Shreveport offers a discount rate for those planning on staying overnight. 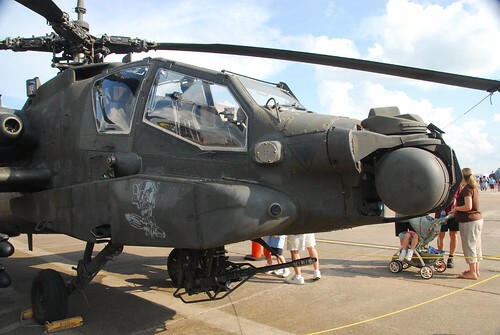 Wheels in the Hills by Foster Orthodontics is a free, kid-friendly event during which children will be able to explore more than 30 large vehicles including fire trucks, bulldozers, helicopters, cranes and more, says Matt Snyder. It will take place Sat, Aug 1, 10 am to 2 pm, at Betty Virginia Park. Air conditioned tents will cool participants between explorations. Money raised through the sale of event sponsorships will be used to purchase school supplies for underprivileged children in Shreveport-Bossier. Donations of new, unused school supplies such as backpacks, notebooks and writing utensils will also be collected at the event. For sponsorship information, contact Matt Snyder at (318) 272-3139 or msnyder@pinpointlocalllp.com. Wheels in the Hills is being produced by the business owners who planned Shreveport Derby Day: Matt Snyder of PinPoint Local Marketing, Grant Nuckolls of Twisted Root Burger Co., Nick and Elizabeth McElhatten of King Hardware and Andrew Crawford of Rhino Coffee. 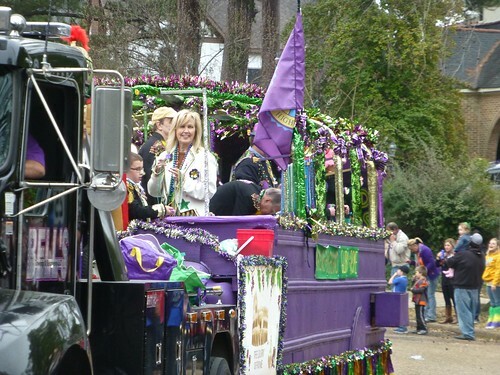 "Have you ever wanted to participate in the fun and mayhem of the Krewe of Highland, but didn't know where to begin?" asks LeVette Fuller. "Look no further. 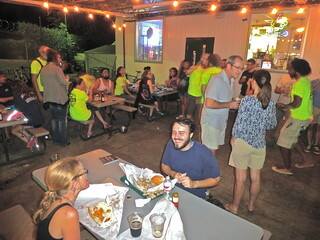 Please join us at Great Raft Brewing between 4 pm and 8 pm on Thurs, July 23, to learn more about the Krewe that represents the best neighborhood in Shreveport." "You'll be able to choose your own adventure: join the Krewe, learn about upcoming events,and buy tickets to our parties," adds Fuller. "If you'd like, you may also sign up to volunteer at parties, the parade, or community outreach." 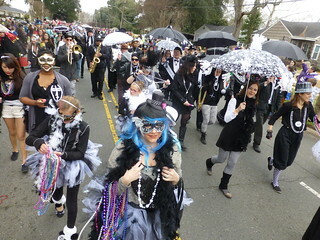 Blanc et Noir Marching Society is part of the Krewe of Highland, having led the parade with brass band and marchers for some 9 years, says Robert Trudeau. This event will give you the opportunity to find out more about the motley, dollar ninety-eight krewe. In truth, a membership in Blanc et Noir is $35. "Dance with us on National Dance Day and support the Shreveport Artists' Market in the Red River District," says Emily Smith. 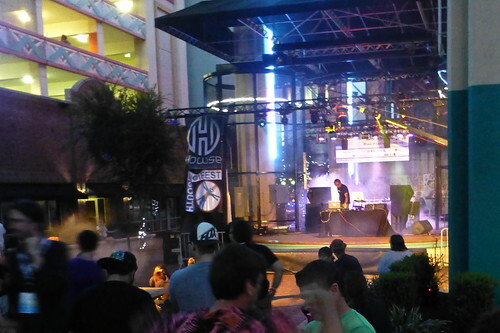 "From 10:30 - 11:30 am on Sat, July 25, it's a flash mob-style dance party!" "Get ready for a good time with choreography led by Louisiana Dance Collective," adds Smith. "So You Think You Can Dance" co-creator and Dizzy Feet Foundation co-president Nigel Lythgoe led the initiative to have the day nationally recognized. Since 2010 people across the country have celebrated National Dance Day in their own ways - with flash mobs, dance-a-thons and YouTube videos. The Times-sponsored Dancing in the Street is in partnership with the Shreveport Artists' Market and its Last Saturday event, which includes art vendors, children's activities, live music, food trucks and more. No charge. Parking is available in the Eldorado parking garage with handicapped accessibility on both the west and east ends of Red River District. Louisiana Dance Collective photo by Claire Brabham. "The Agora Borealis is anchoring the 2nd Annual Cirque du Lake deluxe block party on Friday and Katy Larsen and team are providing Ample, Free Bike Parking at this Awesome, Free, One-of-a-kind Block Party," says Stephen Pederson, "so meet up with us at Columbia Park - see bikeshreveport.com - for a safe, family-friendly cruise into downtown for this great event. That's Columbia Park, Creswell Ave across from Creswell Elementary, at 6 pm on Friday, July 24." Cirque du Lake takes place 4 pm to 8 pm. 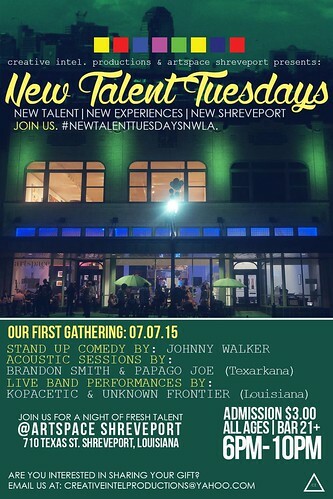 A new wave of North Louisiana artists is scoring outside of Shreveport-Bossier. 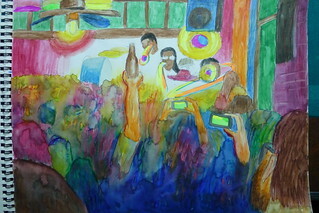 Mark Burt has won places in upcoming shows in Dallas, at the RO2 Gallery, and New Orleans, at the Ogden Museum. 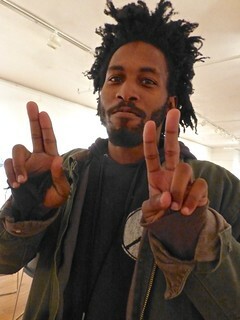 Painters Joshua Chambers and Ellen Soffer will join Burt in a group show at the RO2 Gallery in Dallas. 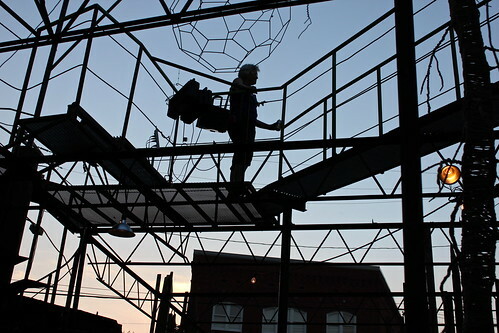 Sculpture by Burt and photographs by Hannah Cooper McCauley, of Ruston, will be in the spotlight on an auspicious event: White Linen Night in the New Orleans arts district. 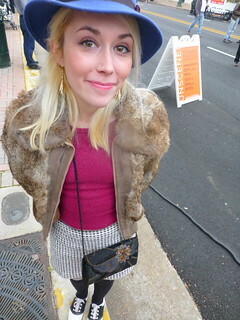 The annual event is mobbed by people dressed to celebrate style, wine and art. 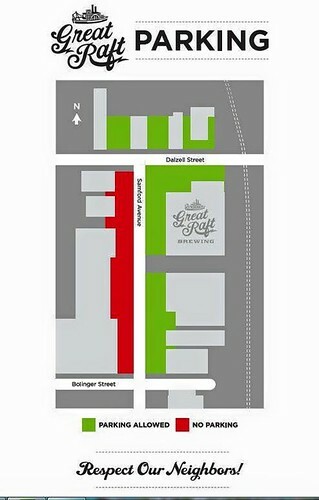 "On the first Saturday evening in August, four blocks of Julia Street will be closed to vehicular traffic for a three-hour, New Orleans-style block party. 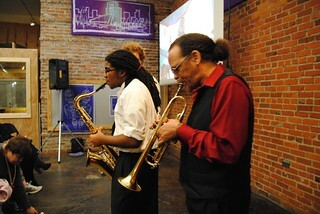 The White Linen Night event, Aug 1, is free and open to the public," says neworleansonline.com. Attendees "are encouraged – but not required – to wear as much white attire as they can, and get into the intended spirit of the event." 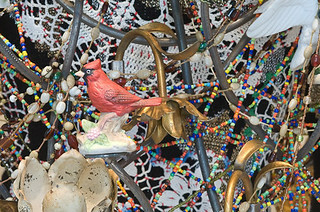 At the near Julia St Ogden Museum of Southern Art the August show is called the Louisiana Contemporary and it includes 2 pieces of Burt's latest sculpture, "Cuddle Doobie 1" and "Cuddle Doobie 3." Also included in the show of what might be called 100 of the most stimulating artists in Louisiana are 2 photos by Hannah Cooper McCauley, of Ruston. Her work is on display at the Bossier Arts Council's Emerging Artists Gallery in an exhibit that continues to July 31.
www.Ro2Art.com 110 N Akard St, Dallas: 214.803.9575. "Beginning July 25, selections from the show can be viewed on the galleries Artsy page at www.artsy.net/ro2-art," says Roth. Arodasi is a school and treatment center created by Dorothy Kristin Hanna to move people to a higher level of health. Hanna says her goal is "to provide passage to an enlightened sense of awareness congruent with one's true nature." She has practiced as a health giver - via Reiki, Feldencreiss, yoga, dance and meditation - for three decades. 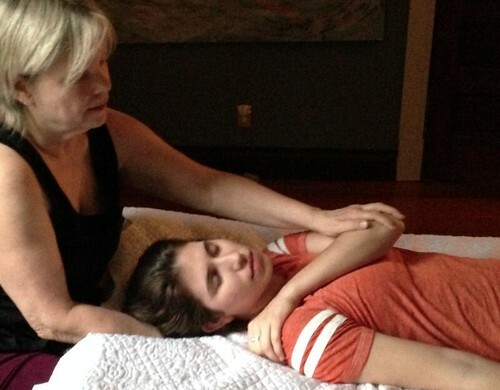 But Hanna brings two lives to her healing practice. 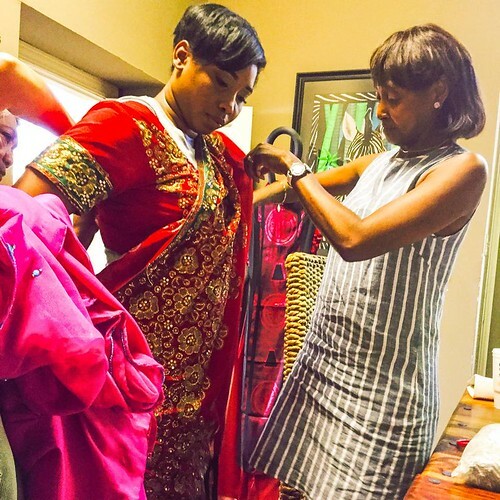 She is known as a painter, choreographer and filmmaker. Yet she is, too, a leader of yoga classes. And being a dancer, she has insight that allow her to be unusually effective in the application of Reiki and Feldenkreiss therapies. Having worked with her as an artist as well as having enjoyed and been refreshed by Reiki sessions, I can give her my highest recommendation. Local media people Kate Archer Kent and Charisse Gibson will join chef Killian in the $50 per ticket supper benefit, says the Multicultural Center of the South. Multicultural Center of the South, 520 Spring Street, Shreveport, LA 71101, (318) 424-1380. Success has come with a not-uncommon cost at Great Raft Brewing, 1251 Dalzell St, Shreveport: finding a parking space has become a challenge during peak time. This map is the latest guide to cooling your jets. Those on a bicycle have the advantage. I have ridden my bike in and out of Great Raft - day and night - several times. When there are batteries in my lights and I am wearing a reflective vest and have riding companions, I feel no hesitations at leaving after dark. If occasionally alarming, it's also trippy. Lindsay Johnson Nations, by the way, has sweetened the pot for cyclists. 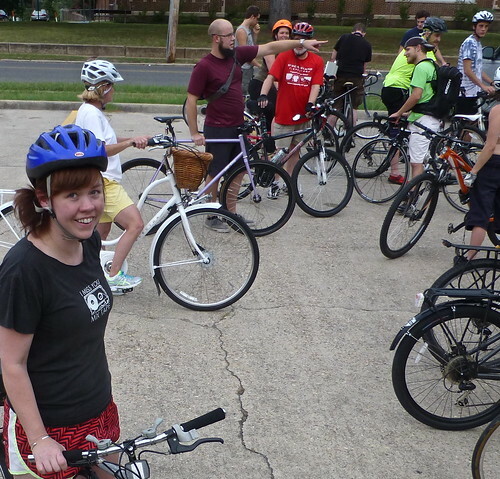 "We want to encourage bicycling as much as possible," she says. 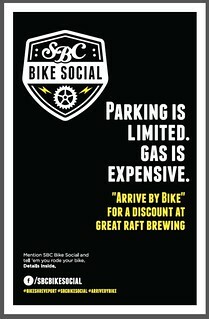 "Those who bike to the brewery get $1 off each pint." "It has been 60 years since the death of our young brother Emmett Louis Till," says community theater director Vincent Williams. 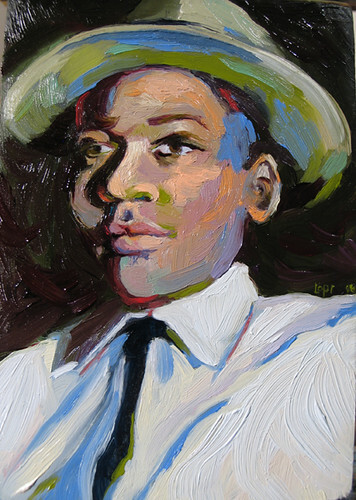 "This play, 'The Face of Emmett Till,' written by David Barr III and Mamie Till Mobley, is a true-to-life dramatization of the death of 14 year old Emmett Till, a Chicago teenager who while visiting Mississippi in August, 1955, was kidnapped and tortured, and murdered by two white men for allegedly whistling at a white woman." Jul 17 at 7:30pm to Jul 18 at 9:30pm. Directed by Vincent Williams. Admission $12.00. You may pay at door. Children under 5 years of age not allowed. Critics from distant parts of the US were imported by Shreveport Regional Arts Council last month to evaluate works by local artists. Among those anointed by the merciless interlocutors from remote shores was poet Nadine Charity. 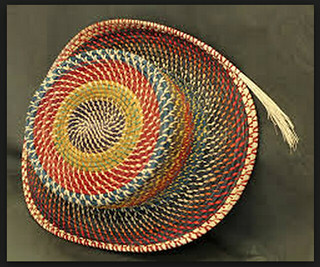 Also bonafide was painter Marilyn Couch. 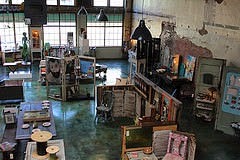 The event, called Critical Mass, produced displays of work at Artspace Shreveport, 710 Texas St. It also results in artist talks. Enjoy both on Thurs, July 16, 5:30 to 8:30 pm. Charity's poetry exhibit is a hands-on experience. She says, "I'm using layers of work. You have to touch the poetry to see it." Pardon me? "I love poetry but I hate poetry shows. I don't want to have to read poetry off a wall." The result of her thinking about that is a clever technique that draws the reader's hands to the wall to explore mysterious print. Cash bar and light snacks. Free and appropriate for the family. Curmudgeons welcome. "To begin with, this case should never have come to trial. The state has not produced one iota of medical evidence that the crime Tom Robinson is charged with ever took place." Gregory Peck in "To Kill A Mockingbird." 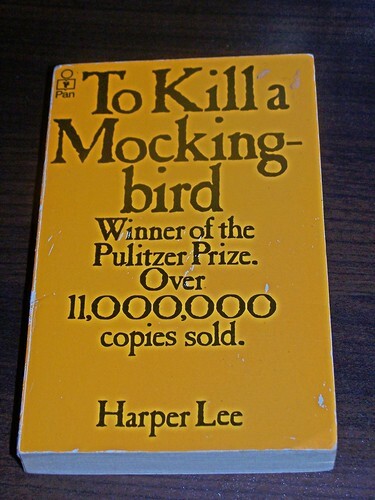 A "To Kill a Mockingbird" reading will be held at Barnes and Nobles Shreveport on Mon, July 13, says McKenzie Hobbs. 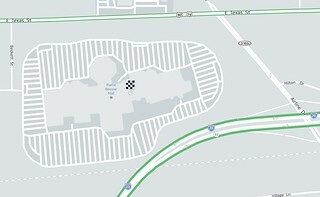 In fact the reading will take place in all the B&N's across the world. "We will be hosting the reading in celebration and anticipation of the July 14 release of Harper Lee's "Go Set a Watchman." The event consists of having the classic read out loud all day. We are dividing the 12 hours into 30 minute reading spots. The event is free and open for anyone to attend. I will introduce the readers as we go," promises Hobbs. Harper Lee had been scheduled to read at noon at the Bayou Walk Shopping Center, Shreveport, said Mr Peck, but something has come up. "Go Set A Watchman" will retail in hardback for about $16. Readers can enjoy the first chapter online courtesy of the Guardian. 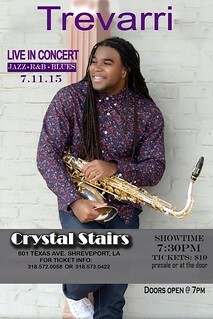 With Justice Jackson on drums, fresh from a year in music studies at ULL, Lafayette, and O'Koyea Huff-Boone, a multi-talented drummer and older brother of Tevarri, the audience is going to have a finger-snapping rhythmic time at Crystal Stairs Restaurant tonight, July 11. From church to funk to complex jazz, Justice and O'Koyea are on time. Trevarri Huff-Boone has created a group that I call the Best Young Players. On keyboards is Erick Coleman, also a college student. Erick and Tre' have played so many jobs together that they can finish each other's musical sentences. Also on keys, Eric Crawford. And on bass, the super fingered Lakendric "Scooter" Davis. They begin at 7:30 pm. Highly, highly recommended for Coltrane-style jazz as well as some blues and r&b. $10 at the door. Crystal Stairs Restaurant, 601 Texas St, is the domain of retired Southern University-Shreveport professor June Phillips and her son, Rod Phillips. The Times' Melody Brumble wrote about them and found that "the restaurant's name comes from Langston Hughes' poem "Mother to Son." Added Philips, "I teach African-American literature. I'm still doing two classes at the university." "The mother in that poem says, 'Life for me ain't been no crystal stair." The Lab Rats Art Camp sessions focus on project-based art in a variety of media, says Steve Zihlavsky. Taught by professional working artists, campers will explore the fundamentals of composition, balance, design, movement, rhythm, unity, contrast, drawing, painting, and sculpture while creating a collaborative public art sculpture. The Lab Rat's campers are encouraged to find and develop their own particular interests and voice. 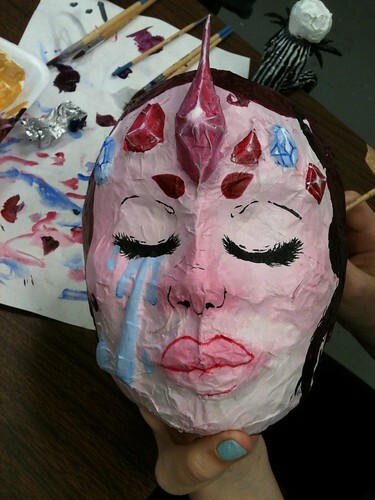 During this time, campers are exposed to a wide variety of artistic styles and engaging discussions. Along the way, campers learn the steps of the artistic process from idea to creation, peer feedback, reflection about their process, and how to present their piece. At top: Bossier Schools Talented Arts student work. "We will be playing jazz (Coltrane, etc), r n b and blues Sat night at the Crystal Stairs Restaurant in downtown Shreveport. 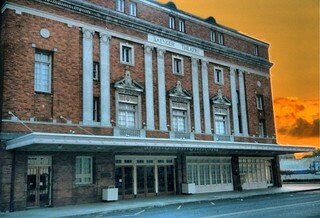 The show doors open at 7, showtime is at 7:30pm. 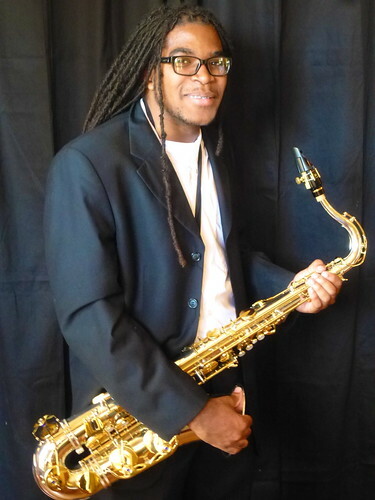 Tickets are $10 for pre-sale or at the door," says saxophonist-pianist-flautist Trevarri Huff-Boone. 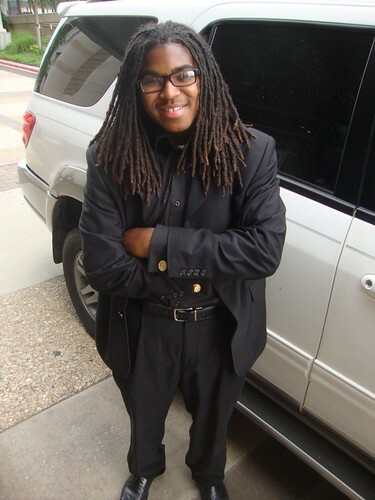 Tre is a performance student at Loyola New Orleans and is already gigging at places such as the House of Blues and Howlin Wolf. While DigiFest South might slam the audience with lights and sound in a mofo concert or show you a starburst of refracted lights at the showcase site, artists should be aware that there is a place for numerous art entries under the DigiFest umbrella. There is a $25 fee per entry. High school students will be judged separately from college students who are likewise separately judged from adult artists. Digifest 2015 will take place Sept 16 - 18, says Bridgette Lee, Community Development Coordinator for Bossier Arts Council, the creators of DigiFest South. More at 318-741-8310. 6 p.m. July 17, 80s Movie Trivia Dinner, $28 ($21, RFC members). Can you name more Brat Packers than U.S. presidents? Do you know what a flux capacitor is? If so, we just might have an ’80s Movie Trivia Crown with your name on it. Celebrate all things 80s at this prescreening trivia dinner. RFC will be handing out prizes for trivia and for costumes, so be sure to show up in your raddest ’80s outfit. Members Club jacket, anyone? The Rewind: “Spaceballs,” 10 p.m. July 18, $9.50 ($7.50, RFC members). RFC’s cult-classic Rewind team will be on hand at the Saturday night “Spaceballs” screening with a Schwartztastic photo booth and in-theater trivia prizes. You can even get a slice of Pizza the Hutt at concessions! On the week's bill:“Spaceballs,”“Beverly Hills Cop,”“The Breakfast Club,”“Ghostbusters." Meghan Hochstetler, RFC director of audience, 318.459.4111, mhochstetler@robinsonfilmcenter.org Above: from the Academy of Children's Theater production of "Fame." The new generation may not smell like the old one, but if you have a nose for the new you might enjoy huffing this. The barker calls himself Leeaux Leo slash creative intel. Hand chops to LJ Thomas and Artspace Shreveport for hosting. Shreve Memorial Library has announced a new semester of Girls Who Code Club, a community-based affiliate of the national non-profit organization Girls Who Code, says Sara Hebert. GWCC seeks to inspire, educate, and equip girls with the computing skills to pursue 21st century opportunities. The Shreveport group will meet on Thurs afternoons from 4:30–7 p.m, beginning with a parent meeting on Aug 6. 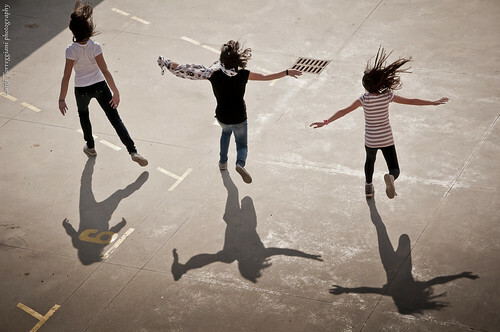 The club is open to girls in grades 6-12, with no previous programming experience required. Interested parents or girls should contact Youth Services Librarian, Elizabeth Hadwin, at ehadwin@shreve-lib.org or by filling out the registration form here. 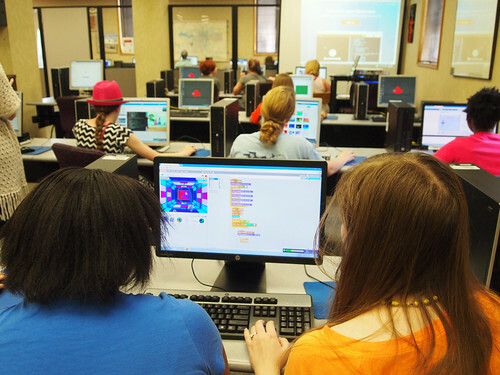 Moonbot Studios developers Kathryn Scelina and Heather Shrewsbury will teach coding basics to a group of 20 girls, using educational programming tools including Scratch and Codesters. Scelina and Shrewsbury co-taught the previous club sessions with Sonia Lowe from Praeses. "I’m so proud of the work our girls completed in our last Girls Who Code Club sessions. 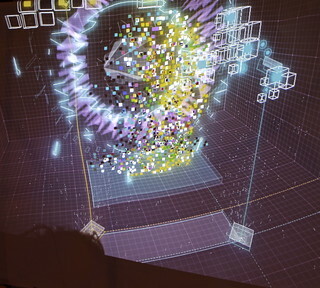 They created creative games, choose-your-own-adventure stories and interactive art. I can’t wait to see what they do next and what kinds of computer science careers they pursue," said Kathryn Scelina. 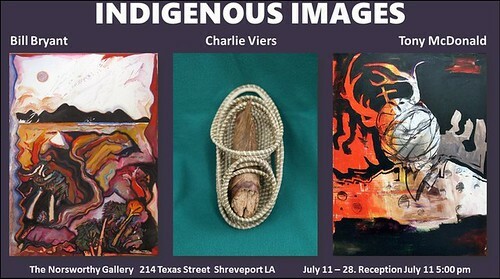 "Indigenous Images is the name given a show of paintings by Bill Bryant & Tony McDonald plus Pine Straw Shapes and Vessels by Charlie Viers," says Christine Bailey. On display from July 11 - 28, Bailey says, "Please Join Us for the Opening Reception on Saturday, July 11, 5 – 7 p.m."
Tues, Thurs, Fri 1:00-5:30 p.m. Sat 12:00-4:30 p.m.
Having pleased the public with a tribute to Stan the Record Man in the March 2014 UnScene, Shreveport Regional Arts Council is promoting another Stan Fest. "Singers, songwriters, bands and musicians of all backgrounds are invited to apply for a chance to perform on Saturday, September 26," says Pam Atchison of SRAC. "All we ask is that you be able to perform/cover at least one song Stan Lewis produced or wrote." Bands (current and past) from the area who have at least one professional studio recording related to Stan may apply to "The Art of the Bands" exhibition. This will showcase - in Artspace - the artwork that goes along with these recordings. Also needed: t-shirts, album art, stickers and more. Apply for the Festival. Deadline 11:59 PM on July 30. 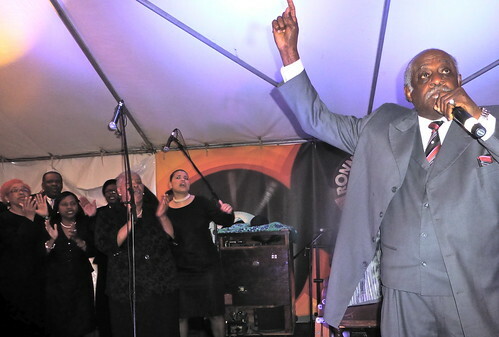 Above: Rev Brady Blade, Sr, of Zion Baptist Church, long-time recording artist for Stan's gospel label. Modest, quietly driven, capable and highly productive, sculptor-sketcher Thomas M Little steadily works at capturing life in Shreveport. His sketches are quick, intuitive and boiling with reds and yellows. He is a laconic man. Yet he is on the scene, enjoying music, crowds and events of all sorts. His stone sculpture has also enabled him to claim a righteous spot in the art scene. Little is a classic artist, isn't he? 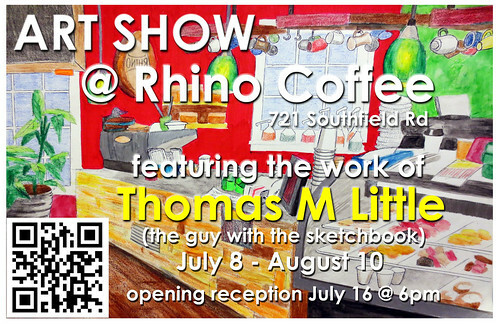 See his exhibit at Rhino Coffee, 721 Southfield Rd, Shreveport, July 8 - Aug 10. Reception July 16, 6 pm. 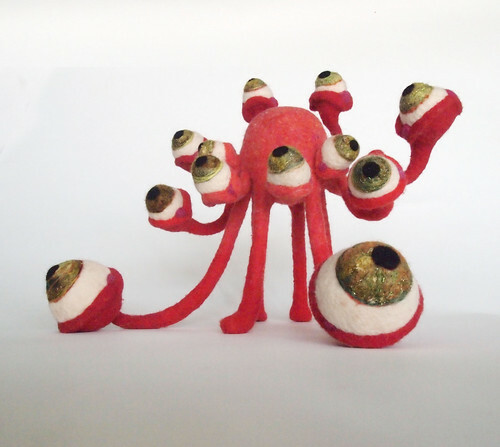 Meanwhile, see work by Little at The Agora Borealis, Shreveport. 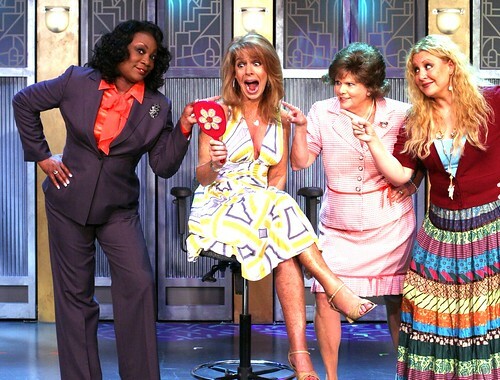 The international hit show Menopause The Musical® plays Texarkana, Texas, in the Perot Theatre, 221 Main Street, for one show only on Thurs, July 30, 2015 at 7:30 pm, says Katie Bosler. Tickets begin at $35. 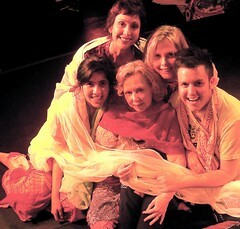 Online tickets at perottheatre.com or call 903-792-4992. Until July 13 tickets will be 20% off when using the promo code Hotflash. Menopause The Musical® is a groundbreaking celebration of women who are on the brink of, in the middle of, or have survived “The Change.” Now celebrating 14 years of female empowerment through musical comedy, Menopause The Musical® has evolved as a "grassroots" movement of women who deal with life adjustments after 40 by embracing each other and the road ahead. The laughter-filled 90-minute production gets audience members out of their seats, says Bosler, and singing along to parodies of classic pop songs of the ‘60s, ‘70s and ‘80s.